Joshua's taking of the southern lands was swift and decisive. The kings of these lands had heard what the Lord had been doing for the last forty years beginning with the plagues in Egypt continuing through the conquest of Moab, Ammon and Bashan, and, even the destruction in their own lands west of the Jordan in Jericho and Ai. Now these kings have seen for themselves the tremendous wrath of the Lord and the obedience of Israel. The word "subdued" in Joshua 10:40 is nkh which means "strike," and "smite." In 10:42 the Hebrew word lkd, which means "to capture," is translated "conquered." 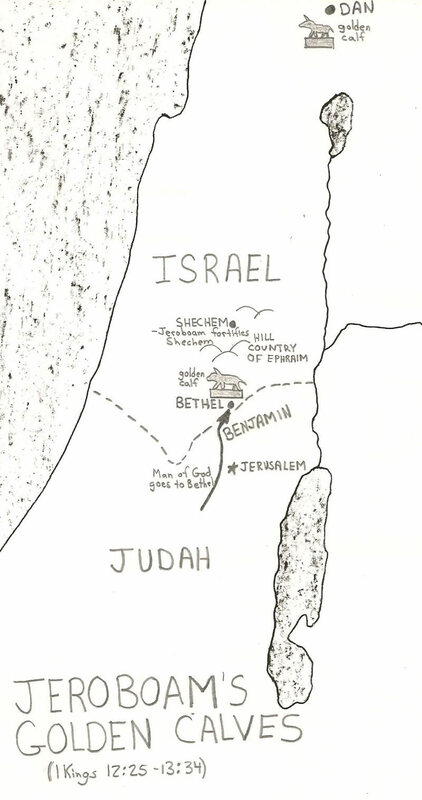 This indicates that parts of the land the Canaanites were totally eliminated, but other parts (as seen in Judges) the Canaanites were not "destroyed" as Israel was commanded, but were subdued and left helpless. These conquered Canaanites that were not destroyed as the Lord commanded will reorganize after Joshua's death and create chaos and defeat among the Israelites. Hill Country - which would be the rolling hills of what would become the land of Judah and Benjamin. 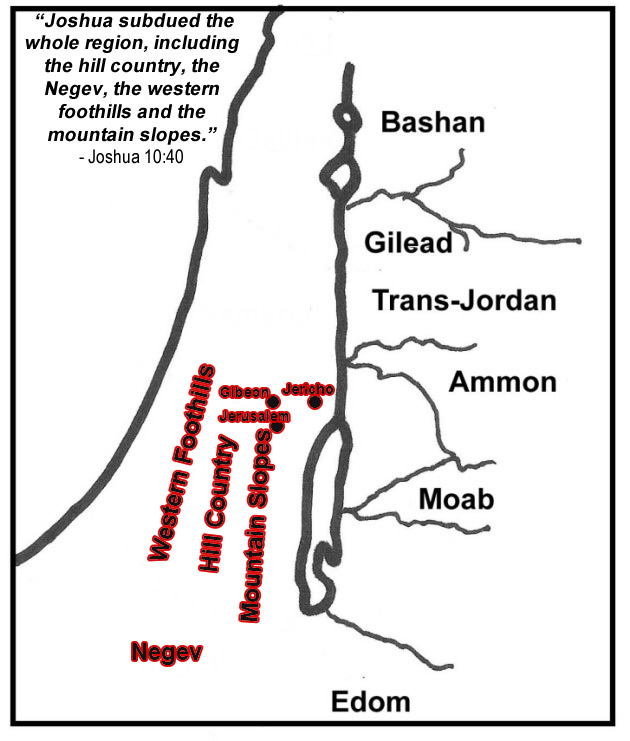 Negev - which was the southern portion beginning around Beersheba and continued down to Kadesh Barnea. Mountain Slopes - the land from the mountain range that runs up through Jerusalem from the south and slopes off to the east into the Jordan Valley, or the Jordan Rift, to the Dead Sea. "There's a mindset in other countries that if you're an American, you're a Christian. Well, those people are sadly misled; they don't know our country. Our country is wicked, and the Christians are few. Just like they're few in other countries, they're few here. There may be many churches and there may be church buildings on every street corner and every corner in our cities across this country, but the true Christians are few." Jesus is indeed the Son of God, the savior of mankind. a man who will rule the entire world as king. when a person does gadal to themselves in Isaiah 10:15 and Job 19:5. The Amarna Letters are a collection of ancient correspondence between the rulers of Canaan and the Egyptian government from 1353-1332 BC. Many of these Canaanite rulers had been taken captive to Egypt, indoctrinated, and then, returned d to their homes in Canaan to rule. In the Amarna Letters the rulers of Canaan ask Egypt for help concerning a variety of issues, including great turmoil and trouble in the land of Canaan being caused throughout the by a people they call theh Habiru in these letters. 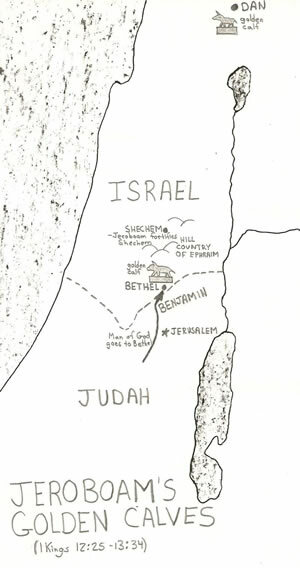 Joshua would have entered the land of Canaan in 1405 BC and by 1400 his five year campaign had ended and the land was divided. That puts the Amarna Letters into the time frame of the independent tribes conqueroring their own lands and the earliest days of the book of Judges. Do obey the Lord completely? Do I follow the full revelation of Scripture? Disobedience and incomplete obedience does not go unanswered. but the wicked are brought down by their own wickedness." 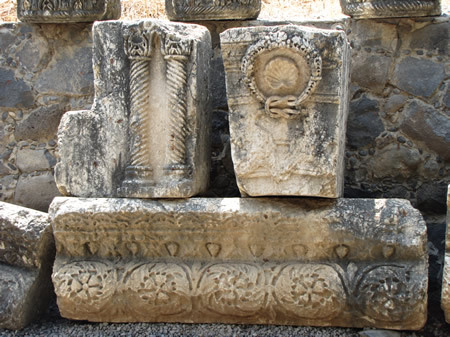 White limestone fragments from the 400 AD synagogue in Capernaum. The stone on the right with the wreath is the keystone from the synagogue. A keystone is a wedge-shaped piece that fits into the apex of an arch. It is the final stone inserted during construction to lock all the stress of the arch and supporting stones into position. Notice the wreath has a double knot at its base with the loose ends of the cord being held and supprted by two birds, which hae been defaced. In the center of the wreath is a shell. The decorative lines engraved in the background would have continued in both directions onto the next stones of the arch. 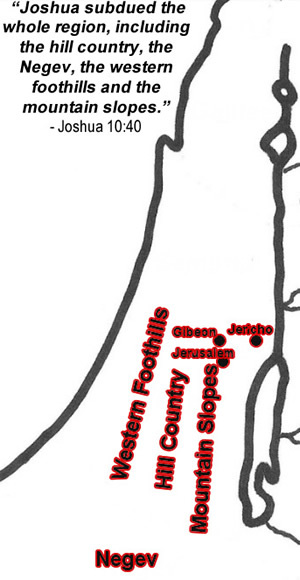 A map shows the location os Jeroboaham's two golden calves that he set up in the northern kingdom called "Israel"